Mutton and Mead was AMAZING! My god, you guys. Mutton and Mead was FANTASTIC! I had heard great things about the show from friends who were there last year, but was still utterly unprepared for the amazingness I experienced this weekend. A shot of Saturday’s crowds at Mutton & Mead. First of all, the site for this show is amazing. It truly gives the feeling of this festival set into a clearing in the woods — from the faire site you can’t see or hear the roads outside at all, which is always something I like in a fairgrounds. We arrived Friday afternoon, and got the tent set up on the far end of the joust field, which dominated the center of the clearing, with vendors and stages set up on all sides around it. I confess, I was a little nervous at first about our placement, which was not on a main row, but that turned out to be unfounded — people walked the whole site, everyplace seemed to have a draw of some kind, and we certainly didn’t lack for foot traffic. Hanging out with the Vixens, Calypso, Hera, Persephone, and Atalanta. How embarrassing…we appear to have dressed to match! I was also visited by Jess, of Geeky and Cheeky, who brought me my very own Loki doll. Hooray! I mentioned to her right after my first viewing of “The Avengers” that, should she HAPPEN to make this doll, I would buy it in a red hot minute, and was thrilled that she was able to hand deliver him to me this weekend. I had at least two people try to kidnap him out of my tent, so hopefully that will bode well for how they sell for her! In addition to simply being a lot of fun as a show, I have to say — it was also a very successful show for me. We had a steady stream of people who seemed to appreciate all the different kinds of things that I do. Sent out lots of business cards, made lots of sales, and went home knowing that I have a LOT of work to do to get re-stocked for the next show, which is always an amazing way to end a weekend. And today? I paid off Idris. 7 months earlier than I had predicted I would. 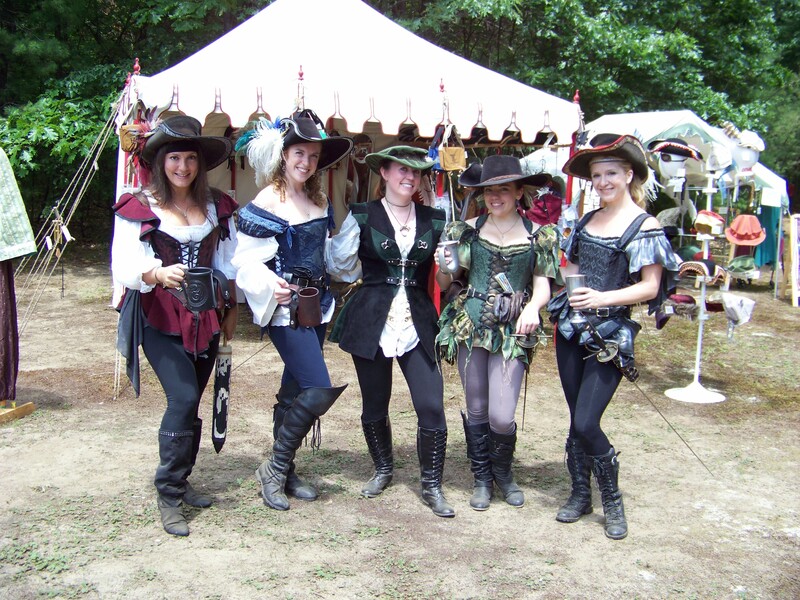 Mutton and Mead Medieval Festival – This weekend! I’ve been spending the last week and a half or so getting ready for our next show — the Mutton and Mead Medieval Festival, in Montague, MA! The show is this weekend, and while I haven’t had a chance to re-stock everything I’d have liked to, I think I’ll be okay. As long as people like to buy Jasmine Jackets and geeky messenger bags and patches, that is! 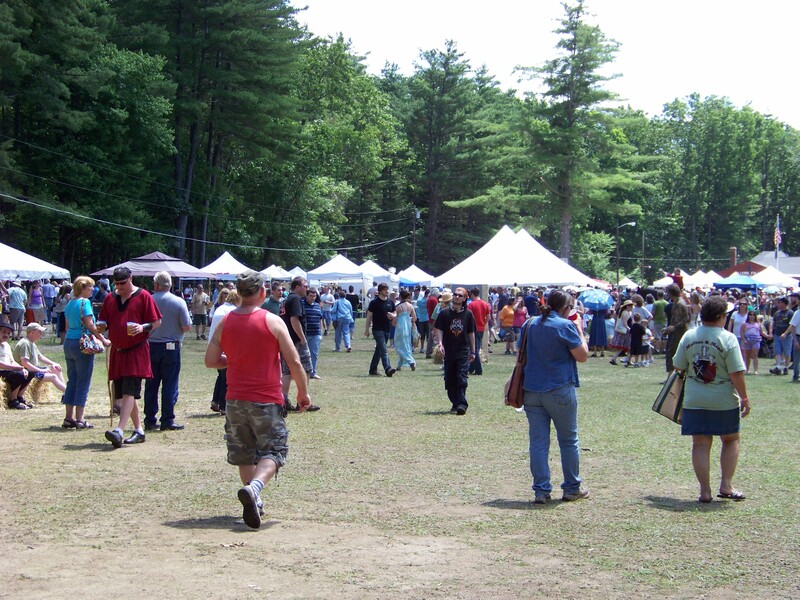 Mutton & Mead is only in its second year, and it will be the first time that I’ve been there. But I heard such rave reviews of the show last year — from performers, vendors, and patrons — that I couldn’t pass it up this year, and got my vendor application in as soon as they went up. I’m also looking forward to seeing a lot of my favorite acts at this show — the Vixens en Garde will be there performing “Titus Andronicus” of all things. (“Sir, you have undone our mother!” “Nay, I have done her.” Best. Line. Ever.) Commedia Mania will be there with several different shows, including a “Cinderella” performance which — I hear — features an ugly step-sister made by Geeky & Cheeky. Giacamo the Jester, Diabolis in Musica, Rufus the Mudbegger….and that’s just the tip of the iceberg, according to their website. All in all, it looks like it’s going to be a fantastic weekend, full of more shopping and entertainment than a person can possibly fit into one day. So you know what that means, don’t you? You’ll just have to come Saturday AND Sunday! 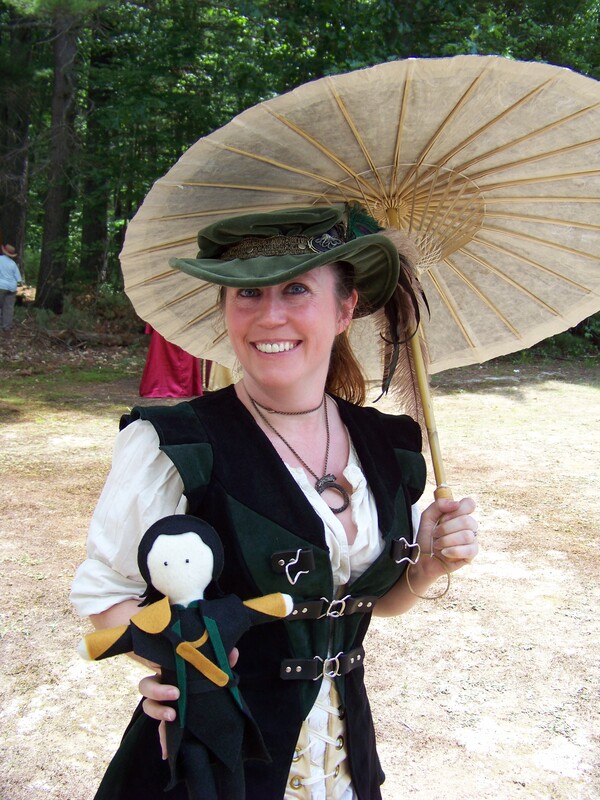 So, I know — the Connecticut Renaissance Faire actually closed over a week ago, and I’m just getting to writing about it now. But that’s okay, because last week I was on vacation. I mean, I wasn’t at my day job. And the original plan was to simply sit in the living room and watch movies and play video games for 7 days straight, but that didn’t really happen. Really, I spent at least a few days in the studio, because you guys ROCK, and filled me up with commissions and Etsy orders that I couldn’t in good conscience leave languishing for that long. This is seriously turning into the best year yet for Storied Threads, and CTRF was no exception to that. 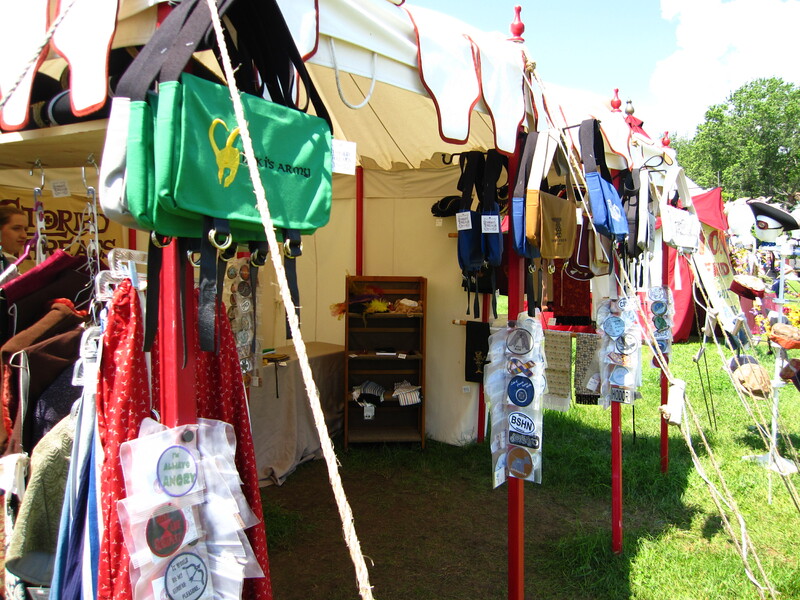 The Storied Threads tent on our final day at CTRF. We had (mostly) gorgeous weather for the whole run — 7 of 8 days full of sun and crowds, and it’s hard to beat that kind of thing. That eighth day, we wound up closing due to site flooding and inoperative flush toilets, which wasn’t so great. But it did mean an impromptu lunch and “The Avengers” viewing (my fifth, I am not ashamed to say) with friends. So while I didn’t make any money that day, it was nice to hang out with people who normally I’d only get hit-and-run greetings with as we all went about our faire days of vending, performing, stage managing, etcetera. And then on Sunday, we all went out with a bang. So to speak. While we got a bit of rain late in the day, and did have to pack up the tent in a thunderstorm, for the most part it was gorgeous, and the patrons definitely came out to play. It was a little sad to see the show come to a close — the four weekends seemed to fly by! 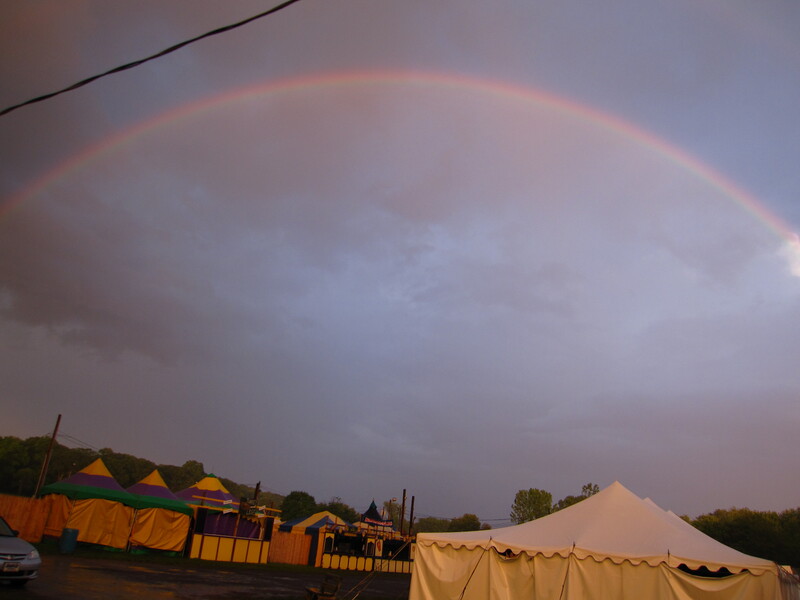 The full rainbow that showed up as we packed up in the rain at the end of the run. And now, I’m prepping for my next show — the Mutton and Mead Medieval Festival! Trying to re-stock as much as I can, and hopefully we’ll have a good selection for you all. Though if there’s anything in particular you want to see there, please let us know!